Kyzyl Hosting Tuvans from All Over the World! Today the First Congress of ethnic Tuvans opens in Kyzyl. The most numerous delegation is that from 'Big Tuva' (Tuva itself). It comprises actors, writers, scientists etc. 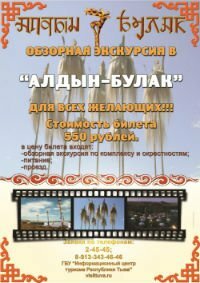 85 Tuvans will come from Mongolis (Khovd and Bayan-Ulgii aimaks), Irkustk, Altai and Buryatia. Due to some visa problems Tuvans from China won't be able to come.